Serving midwestern contractors since 1970. Landscape At E&M precast, we are committed to providing the highest quality, accurate pre-cast with the most efficient and thorough service available. Employment Our company's roots were planted in Gower, Missouri, over forty years ago. Our fifteen acre pre-cast concrete operation grew out of our ready-mix concrete plant, opened in 1965 to serve the area housing industry. In 1970, we began to notice the scarce availability of good quality precast products. E&M Pre-cast was founded to fill this void. At E&M, high quality isn't something we strive for. High quality is something we INSIST on. We continually follow up with clients to evaluate our products' performance. . . and the customer's satisfaction. Our high standards keep customers coming back again and again. It is our history of quality products and customer satisfaction that is providing the solid foundation on which our future growth will be built. We truly are anchored . . . and growing. 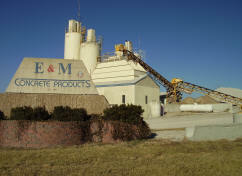 E&M can handle all of your pre-cast concrete needs efficiently and thoroughly. We hope you'll give us the opportunity to commit our superior products and service to the success of your next construction project.